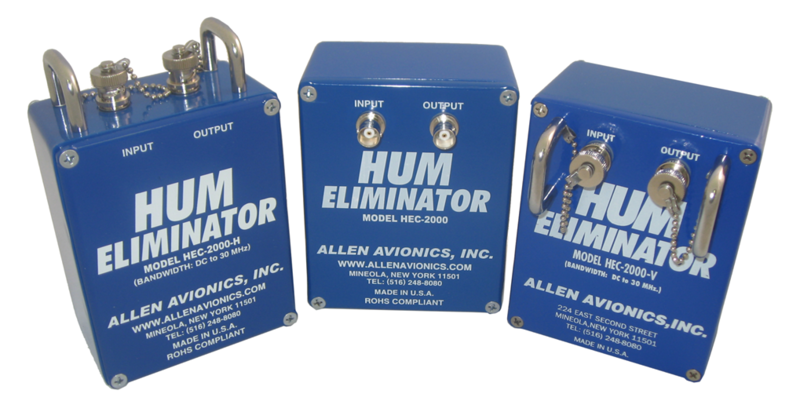 Broadcast quality hum eliminators designed to eliminate hum and other interference in video lines up to 30MHz. Perfect for all RGB applications. Single and Multiple channel products are available. HEC-500 50 Ohms Unbalanced 20 dB min. Hi-Impact ABS Plastic Four (4) 8-32 x 1/2" Inserts 2.5 lbs. HEC-1000 75 Ohms Unbalanced 20 dB min. Hi-Impact ABS Plastic Four (4) 8-32 x 1/2" Inserts 2.5 lbs. HEC-2000 75 Ohms Unbalanced 20 dB min. Die Cast Metal Four (4) 6-32 x 1/2" Inserts 3-1/2 lbs. HEC-2000-H 75 Ohms Unbalanced 20 dB min. Die Cast Metal Four (4) 6-32 x 1/2" Inserts 3-1/2 lbs. HEC-2000-V 75 Ohms Unbalanced 20 dB min. Die Cast Metal Four (4) 6-32 x 1/2" Inserts 3-1/2 lbs. HEC-5000 75 Ohms Unbalanced 20 dB Min Die Cast Aluminum Four (4) 6-32 x 1/2" Inserts 6 lbs.